No matter what technique you specialize in, what level your skills, or what you do with it once it's finished, it's quite possible you'll end up taking photos of your beadwork. The way you shoot beadwork photos is important, even if the results are used only to show Aunt Milly in Poughkeepsie what's been keeping you from her Sunday pot roasts. 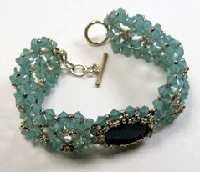 But if you’re using your beadwork to make money, good photos are especially important. They not only record your work, but also market it. Case in point. I recently spent some time submitting class proposals for next year's bead shows and realized that I was in dire need of good photos. I'm no photographer, but once I spent some time figuring out my digital camera and experimenting a little with lighting and styling, I now feel comfortable shooting my work at home. It seems the biggest component in jewelry photography is styling, or how one arranges the piece inside the camera frame. I figure I have about 2 seconds to get the interest of anyone who's looking, so want to make sure that my photos contain only what I'm selling–no props, no people, no pets. That said, there's a fine line that can be drawn between a photo that looks like a wasted celebrity's mug shot and one that looks like it's from a jewelry catalog. One big difference is how you angle the camera while you're shooting. You could call this one the mug shot. Yawn. Here's the bracelet rolled up, making it a bit more interesting than flat, but this bird's-eye view makes it impossible to see the bracelet's qualities. Okay, I'm moving down the front at an angle now, but I still can't see the bracelet properly. I can see the front better now, but it still looks like a celebrity with a Cosmo-induced fender bender and an appointment with the D.A. I've moved down the front even more now. This makes for a little friendlier, more intimate shot since the light is coming nicely through the focal bead now, but I've lost the back of the bracelet and that seamed background is a distraction. I've moved up a bit and over to the right to catch the back of the bracelet now. Getting there. I like the focal bead a little off center, so moved back to the left slightly. This one isn't too bad but the droopiness of the wristbands is bugging me now. Think I'll resort to a prop. Well that takes care of the sagging sides! I don’t think this is her best angle, though. Ahh. This one would work! But it may be too artsy fartsy for a class catalog. Back to basics . . . Perfecto! 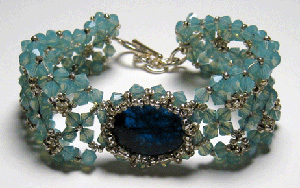 No Beading Daily This Friday: There will be no Beading Daily on Friday because of the 4th of July holiday. 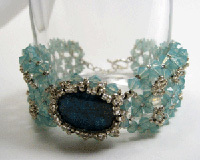 You can always come by and check out the forums if you need a beading fix! Some of the current hot topics are finding your unique jewelry style, taking good photos, and what to charge for restringing necklaces. 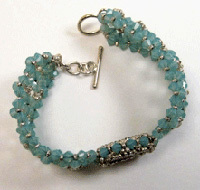 Jean Campbell writes about beading and life every Wednesday on Beading Daily. If you have comments or questions for Jean, please post them on the website. Thanks!